Win MS Points for every activity you do on MouthShut. Sign In now to participate. When your friends register on MouthShut.com you win 10 MS Points! Junk, abusive, copied and promotional content - not acceptable. No MS Points will be credited for such content. Only genuine, personal reviews are eligible for MS Points. Your profile should be updated, along with a real DP of yourself. Reviews should be on products or services recently bought or used by you. Movie review should be of movie currently in cinema. MS Points will be converted to cash and credited on every 20th day from the last closing month. It may take upto 10 working days for the money to transfer. MouthShut.com's decision is final. Please read complete Terms of Services for acceptable content. Is KYC document required for writing reviews? However, KYC document is required if you need to convert your MS Points into cash for Write-Share-Win Contest. MS Points are rewards you earn for activities on MouthShut.com, such as writing a review and inviting friends etc. How quickly do MS Points reflect in my MouthShut.com account? MouthShut.com's system is designed to update in real-time. However, it may take upto 48 hours to reflect all the valid MS Points. Junk/Spam/Plagarized and copied reviews are not eligible for MS Points. 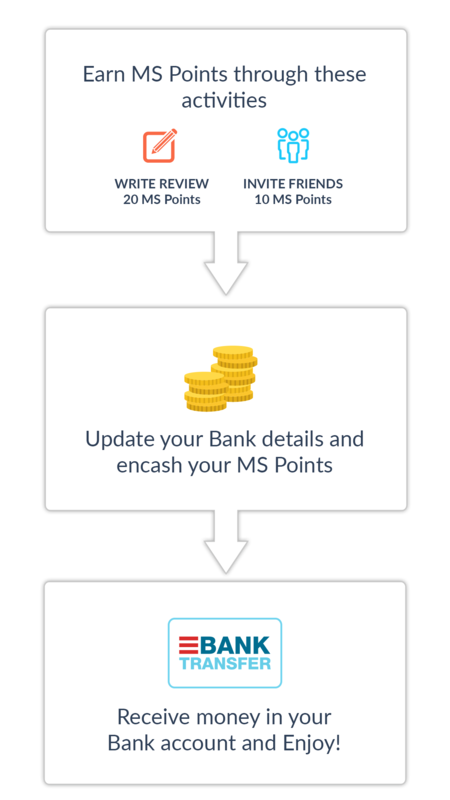 What is the benefit of MS Points? Currently we allow you to encash MS Points to cash. This means MouthShut.com will transfer you cash rewards in your bank account. How can I update my Bank details in MouthShut.com? Is it safe to share my bank details? Once you've earned 500 MS Points you will see a message in your MouthShut.com account asking you to update your bank details. You can click on this link to update your bank details.Your privacy and data is important to us and we protect your information from identity thefts by using Secure Sockets Layer (SSL). Does winning MS Points make me an employee of MouthShut.com? No. MS Points is a part of the Write-Share-Win Contest run by MouthShut.com purely as a marketing tool. It does not create any employer-employee relationship with MouthShut.com, or with any of its sister Organisations. Will I have to pay anything to become a member on MouthShut.com / participate in this contest? No. We will never ask you to send us any money, rather we will be sending you money for your eligible MS Points. Please remember, MouthShut.com will never ask you for your ATM PIN or Bank Passwords OR ANY PASSWORD AT ALL. Do not fall victim to scams and do not pay any joining fees or membership fees to anybody to become a member on MouthShut.com. What exactly should I write a review about? Pick a product or service you've bought or used. Share your personal experience about it. Keep your reviews informative to help others make buying decisions. Is there a limit on the number of reviews one can write in a day? Write as many reviews per day. No more keeping your Mouth Shut. No upper limits to how much you can earn! What about limits on number of invite friends? The more the merrier. Earn 10 MS Points per active friend invited. Why does MouthShut needs KYC ID proof? Since MS Points are converted to cash, and transferred to your actual bank account, we need to make sure that the account details on MouthShut.com is the same as the person in whose bank account we are transferring cash. Does MouthShut really give away Cash Prizes?